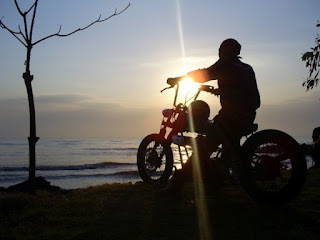 This is picture of my friends from Black Mangoes Motor Club which is taken at Tirtamaya Beach, Indramayu – Indonesia. Shoot in the morning during the sunrise. I like the lighting and atmosphere of silence. Kawasaki KZ-200 Year 1983 modified with chopper style make the perfect silhouette of this picture. Thanks to Embong for the great job. Belum ada tanggapan untuk "KZ200 Rider On The Beach"